Volk’s Electric Railway is the oldest electric railway in the world. Opened in 1883, it was invented by Brighton-based engineer and inventor, Magnus Volk. 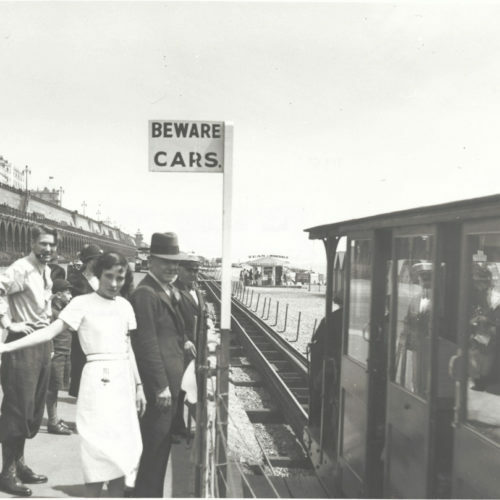 The train carriages still run along the seafront today, and give passengers an authentic ride between Aquarium Station (near Brighton Palace Pier) and Black Rock Station (near the Marina). Aquarium Station is part of the newly-built Visitor Centre. Here you will find more information about the history of the Railway and Magnus Volk, the man who invented it. Take the train to Halfway Station to see the Workshop, where you can see maintenance being carried out on the historic train carriages and find out more about how the Railway runs. Carry on to Black Rock to finish your journey near Brighton Marina.